How much have you saved by joining FreedomPop? FreedomPop's mission has always been to make voice, text, and data service 100% free. You can save thousands of dollars every year thanks to FreedomPop and get the same quality of service or better! So, how much have you guys saved so far with FreedomPop? Additionally what carrier did you port in from? I am cutting off the xfinity high speed internet, cable TV and a land line for about $200 a month in savings. I saved over 1000 dollars over the past 2 years. I switched from MetroPCS. I had a ptel account for $5 mo. Still have it. So savings is in phone calls used. About 40 since getting FP a year ago. 5 cents each for $2 savings. I've been with FP for 1.5 years and had 4 Photons plus some sticks I barely used. Comparing with Comcast usage and costing, I average about $1 per gig for them. My consumption out of 4 Photons, 3 sticks, 1 803S, and 3 Phones might have been 2 Gigs a month for 18 months. 36 Gigs --> $36 savings. I spent approx $220 in acquisition and usage fees. Just comparing the WiMax devices its $35 value less $25 costs for a total net savings of $10. Such a Deal ! LTE will have to wait a few years to determine when it gets around to being shutdown also. By then it may look much better savings than the WiMax numbers. $75 / month over the last year. seriously? how much money? man i would be here 3 hours trying to add up all the phones,hotspots and how much money i have saved in almost 2 years with freedompop.you best believe i spent so much money since my first phone in 1993.the only thing left for me is a freedompop iPhone so as soon as i save some cash i will have one and I'll be saving iPhone money.my birthday is Christmas eve if anymore want to look out and get me an iPhone.you'll own me! if you are here reading this post on the fence thinking about getting freedompop,you will not regret it.do it today because there are so many good deals during this holiday season.they will be gone soon.stop sleeping! Anyone else feel free to comment below and share your experience! Was with Virgin Mobile at $35 / mo a year ago. Offsetting the phones $70 cost, I've saved ten months at $35 each .. or $350. But my service is not without minor issues. The only reason I own a cell phone is because of Freedompop's awesome pricing. The cost of the phone is a big out of pocket expense, but my land line was costing me $35/mo. Definitely worth the switch! only does damage to the peg. I have to be honest and say that I was saving about $30 a month over my old MVNO, but I moved back to Verizon after just having too many issues with local numbers, not being able to port my number in and call quality. I'm still rocking my GS4 for messaging with Hangouts and 'work' but voice just wasn't reliable enough for me. I'm also still a bit stung on the fact that I sent back my LTE hotspot as requested 2 months ago and heard nothing back on it yet. So, overall, I spent $130 for the unlimited plan for a year with the GS4, $40 for the hotspot, and cut $90 off my bill before we switched back to a major carrier. I'm in the hole $80 right now. That's not to say that FP wasn't ok, but with the amount of issues just getting calls through - or the phone not ringing when people called me - just didn't work for me. I'm still here though and trying to submit feedback and help out where I can! I'll add in for my mother in law that had her DSL bill jump to over $70 a month until I got her a 431u aircard. A gig doesn't sound like much except she checks her email, searches a few things and the biggy, a bit of her favorite radio station in the morning. So that's between 8 and 900 dollars a year and she doesn't notice a difference except the DSL would drop her radio station every few minutes and the air card doesn't. Thanks FreedomPop for making my Mother in law happy. It's hard to call it savings when the service almost never works, and they bill you automatically for top-ups you have already disabled on your billing account. I haven't been with freedom pop but a few days and actually I'm already in the hole.they snuck $5 dollars off my card for something i didn't do.then want to charge me $15 for data overage which would not have happened if they would have reupped my data with the ill gotten $5.I even had to cancel my card because they think I'm paying the $15.,I'm not.I'd like to get the $34.99 package but I already don't trust freedom pop. Stuff like this takes time I don't have. HEY FREEDOM POP ARE YOU GOING TO MAKE THIS RIGHT OR NO. MY FRIENDS WANTED TO GO WITH FREEDOM POP BUT NOW THEY DONT. FREEDOM POP. IM WAITING TO HEAR FROM YOU.9122826904 IS MY # James Shiver. How could you Not Save Money with Freedompop. If you know how to use the device, and you make sure you are in a coverage area. Research anything you plan on purchasing or using. You can get away with Free. Google is my Friend. I think I researched Freedompop and the device I first got for 1 month before I made the purchase. Was a Ipod and the rocket. I used that for a good 2 months. I got familiar with FreedomPop's System. And around 250 device later, here I am, 2 years later!!!! I had only 2 issues out of 250. One was a defective screen and the other was a OEM compatibility issue. Both times, The replacement was flawless!! I never heard one single no. Read everything before you hit send or activate, even the small print! Research your area of coverage, and your Device. Make sure to ask 100 questions before you pull the trigger! Penny Horder only include the plan in the amount for a Family of 5(great savings!!). I have also saved with Freedompop in other areas. My hotspots, my device I gave to family members and Friends-some devices I resold. If I had to put a dollar amount in the money I have saved. I can tell you through the 2 years I have been a member, it has to be around 5-6,000$ easily! !Could be More!!! I have never lost a penny here on Freedompop! I love to help out here where I can, and Freedompop has done me and My Family Good! !We have Great Cell Service , Great Cell Phones, I have a hotspots for every occasion! !Plenty of FREE DATA! I have saved a Ton of Money with these guys!!! 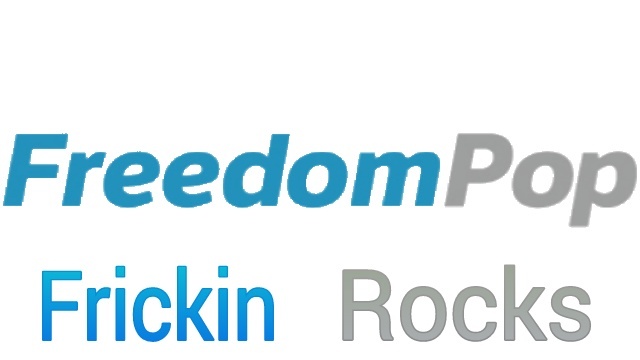 You can't go wrong with FreedomPop!! The Fulwider Family Thanks you!!!!!! How much have I saved from joining FreedomPop? OMG, lots and lots of dough !!! No, it's more like $70.12 per year--under the free phone plan with visual voicemail, compared to the $100 prepaid yearly service that I had. I have a question wasn't sure where to ask..I signed up for the free 200 minute plan but my credit card was still charged 4.99..is there a reason why? Well for over a year I've had basically free cellular service, but I've recently got a new job and had to get on Verizon for the best call quality and coverage. Thankfully have my hotspots to supplement my low data package at least for when I'm within Sprint LTE coverage. I got the new chip for my old T-Mobile phone. I unlocked it on the internet for 6.99 about 2 years ago, and never used it. I got a cheap windows phone for 10 bucks at the dollar store and got pruetalk USA account for 5 bucks a month. It was only a voice/text account without data, and only 180 minutes talk time. I hated the windows phone, and have been looking at fredompop for like a year thinking about trying a free account. So when I saw the new sim chips worked with unlocked T-Mobile phones I decided to go for it. I don't use a lot of minutes, and basicly using my phone only when running around town. I think the free plan will work out great for me. The internet is a real bonus! My old T-Mobile phone was costing about 60 bucks a month. So compared to the service I was using before with this smartphone I'm saving 60 bucks. Plus I get to use my HTC One S which is badass compared to that crappy windows phone! A free plan with more Voice minutes then 5 bucks, and data!! Yep!! Hi ordered a Sim on June 13, order #50638744 and it has not shipped. Sent emails and no replies. Can anyone help? i have saved nothing the service has never worked correctly and i keep getting charges on my debit card for supposedly FREE service! i have tried downgrading and cancelling account and still got charged! The phone service is poor quality and have never been able to text or use the data when I have no wifi connection so even the small amount I paid at first was a waste of money and add in the charges for my so called free service and the nsf fees i have been charged im in the hole about 100 dollars for my so called FREE service! !